That future image of Liverpool winning the title with Klopp and Sturridge performing the dance off on the pitch is sweet. Klopp is an excellent communicator. In his first press conference he talked about the need for people to change from doubters to believers. I know Klopp is not the messiah. He has confirmed that he can't walk on water (though I'd like to see this tested). I know all about the difficulty of Being Liverpool Manager with finances that predict a 5th place finish. I know he will need time. I know I should temper my expectations. But I'm a Liverpool fan. I know that crowds change games. Of this I have no doubt. I stood on the kop against St Etienne, part of the holy trinity, and changed the outcome of the game. The odds were against us when St Etienne equalised but we all believed we would win. And we did. Fairclough's passion and bond with the crowd was tangible. I've seen many such examples over the years. With belief and passion comes the power to change the status quo. 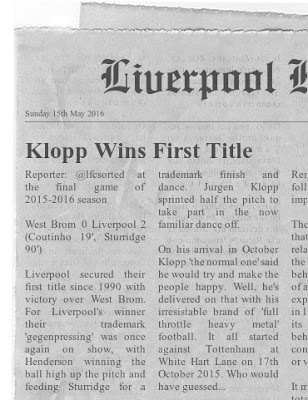 All Liverpool fans dream about winning the title again. A dream is defined as an indulgent fantasy of something that is greatly desired. A dreamer without a plan is a doubter. Klopp has a plan and makes an important point: to change we must believe. He will inspire (and train) the team to believe that they can beat anyone. We, the fans, also have to believe. 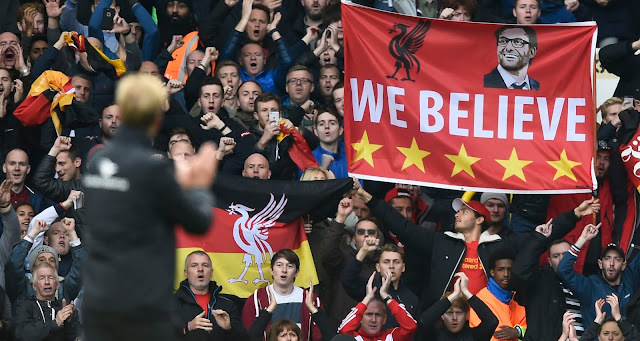 This common belief between fans, manager and team will energise - Anfield has seen many examples of this. This is about being passionate. Giving 100%, always. Letting logic go; reducing the probability of finishing 5th and increasing the probability of finishing 1st. In this way we can change the status quo, one small step at a time. Here is a view of the travelling Kop at Jurgen Klopp's first league game at White Hart Lane on 17th October 2015, one week after this article was published.